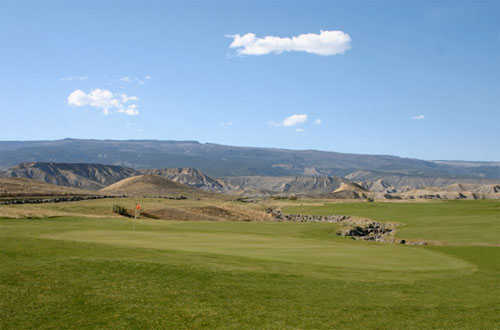 Located in the foothills north of Delta Colorado Devil's Thumb Golf Club offers a unique blend of characteristics. 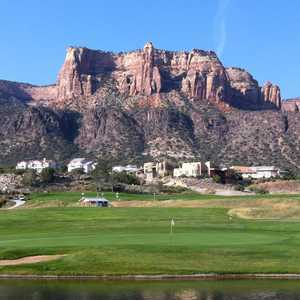 Ones concentration can be wavered by the beautiful backdrop of canyons and mountains seen from the course. 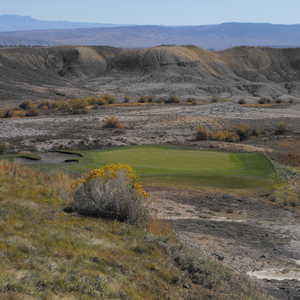 Grand Mesa to the north and the San Juans West Elks Black Canyon and the Uncompahgre Plateau finish the picture to the south making Devil's Thumb one of the most uniquely scenic courses you will ever play. Devil's Thumb is a unique, remote and beautiful course. I played it again on day 2 of a 5 day golf road trip. The greens were in super shape in spite of the very dry winter. They'd actually hauled truckloads of water to the course in the winter to keep it in good shape. Taking the gravel road entry to Devil's Thumb made us wonder if there really could be a golf course in this remote area years ago but it's paved now. But indeed there is and it's a real treat. The surrounding landscape looks like something one might expect on the moon.........or the mesa of Western Colorado. Rick Phelps did a great job of carving a fun 18 hole track through some deep valleys and ravines. Lucky hole 13 is a classic. I liked the risk/reward off the tee but the pin was set on the crest of a ridge on the green that made the approach almost impossible to hold. The 10th hole is a great driving hole dogleg right. Bite off as much as you dare by flying the pond and cattails. And 18 is a nice par 5 finishing hole.....as long as you avoid the pond on your right and in front of the green. The fairways are lush and fairly wide. The roughs are very dry and rocky but recovery shots aren't too difficult in most cases. 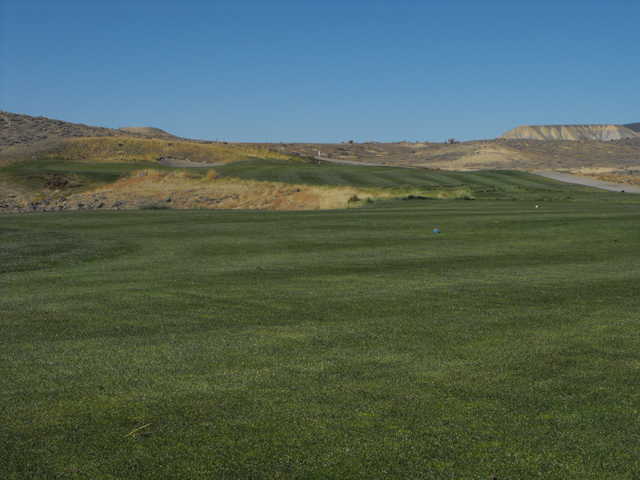 The Devil's Thumb is visible on several of the holes. I look forward to playing it again. Devil's Thumb is a unique, remote and beautiful course. I played it with my nephew as our second 18 of the day after playing Redlands Mesa in Grand Junction. What a wonderful day! Taking the gravel road entry to Devil's Thumb made us wonder if there really could be a golf course in this remote area. But indeed there is and it's a real treat. The surrounding landscape looks like something one might expect on the moon.........or the mesa of Western Colorado. 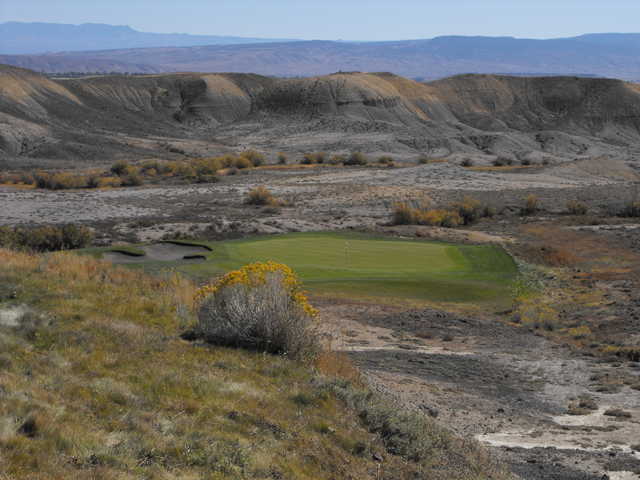 The Devil's Thumb is visible on several of the holes. We played late in the afternoon on a wonderfully secluded course. Perfect end to a perfect day. I look forward to playing it again. 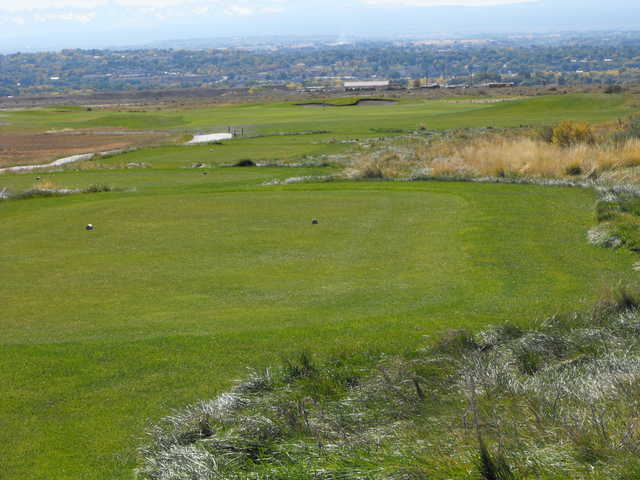 I have played Devil's Thumb numerous times and have enjoyed every round. Tee shots are difficult on a number of holes - especially if the wind is blowing. The greens have been fantastic since the very beginning and putts roll true. Not a big fan of the 13th green - I would like to see them flatten it a little - especially in the back. When the pin is in the back - good luck! I have played this course every year since it opened and have brought numerous friends as well. So I guess that tells you what I think of it, excellent. BTW, try to drive the pond on #10 when the wind is blowing, good luck. What a nasty, nasty course! You really need to trust your abilities from the tees because there is not much room for a miss. The greens are tricky for a muni course. The view is impressive everywhere on the course. When humans colonize the Moon, or Mars, I expect to see a course resembling Devil's Thumb. Too bad the course loses $500,000/year and may be headed for bankruptcy, ouch! One of the best in western Colorado. Well worth it. Super staff as well. 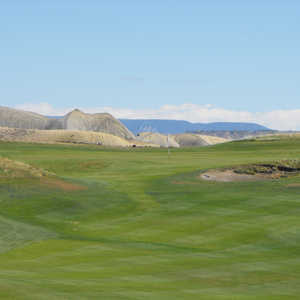 This is a great golf course and in my opinion one of the top three courses on the western slope of Colorado. 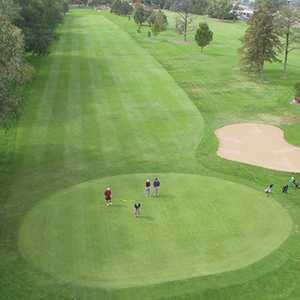 The fairways and greens are always kept in excellent condition and each hole has its own special character.